A 46-year-old white man presented with decreased VA of 20/30 in his right eye and 20/25 in his left eye associated with headaches. Dilated fundus examination revealed bilateral optic disc neovascularization, white-centered retinal hemorrhages, venous dilation with areas of telangiectasis, and retinal neovascularization (Main Image). The patient had an elevated white blood cell count of 243.9 K/µL (normal: 4.3-5.7 K/µL) and a hemoglobin level of 7.9 g/dL (normal range, 13.8-17.2 g/dL). MRI of the brain revealed a frontotemporal lobe lesion. The lesion was excised by craniotomy and determined to be a granulocytic sarcoma of myeloid cells. Fluorescence in situ hybridization revealed a BCR-ABL translocation [t(9:22)(q34;q11.2)] resulting in the formation of the Philadelphia chromosome. 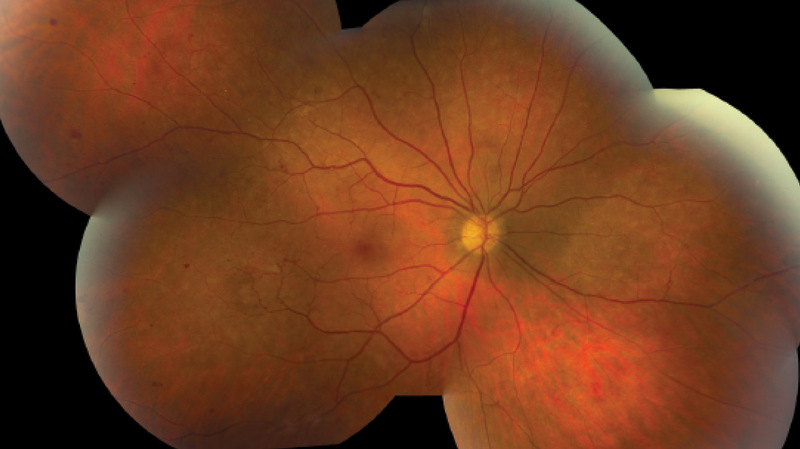 Based on these findings, a diagnosis of chronic myelogenous leukemia (CML) with severe leukemic retinopathy was made, and the patient was treated with dasatinib (Sprycel, Bristol-Myers Squibb/ Otsuka), a tyrosine kinase inhibitor. 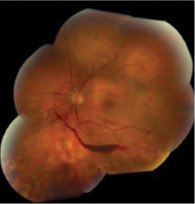 Despite good control of systemic disease, CML retinopathy progressed, with recurrent preretinal and vitreous hemorrhages in each eye (Insets, left and middle). 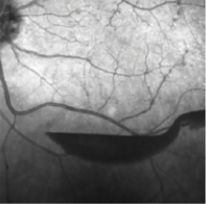 Bilateral full panretinal photocoagulation was performed, followed by pars plana vitrectomy with membranectomy, endophotocoagulation, and gas-air exchange (16% C3F8) in each eye. Final VA is 20/25 in each eye with no signs of active retinopathy (Inset, right). The patient continues to be in remission of CML. 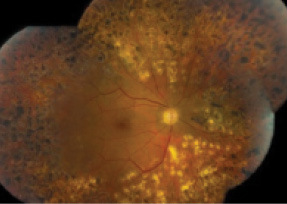 Clinically evident ocular involvement is found in 50% of patients with leukemia. The two main types of ocular involvement include direct leukemic infiltration of ocular tissues and secondary leukemic retinopathy (eg, retinal hemorrhages, cotton wool spots) from hematologic complications of leukemia such as anemia and hyperviscosity. Peripheral neovascularization secondary to hyperviscosity and capillary nonperfusion is common in patients with CML, occurring in approximately three-fourths of patients. The pathogenesis is capillary dropout producing neovascularization and secondary traction. 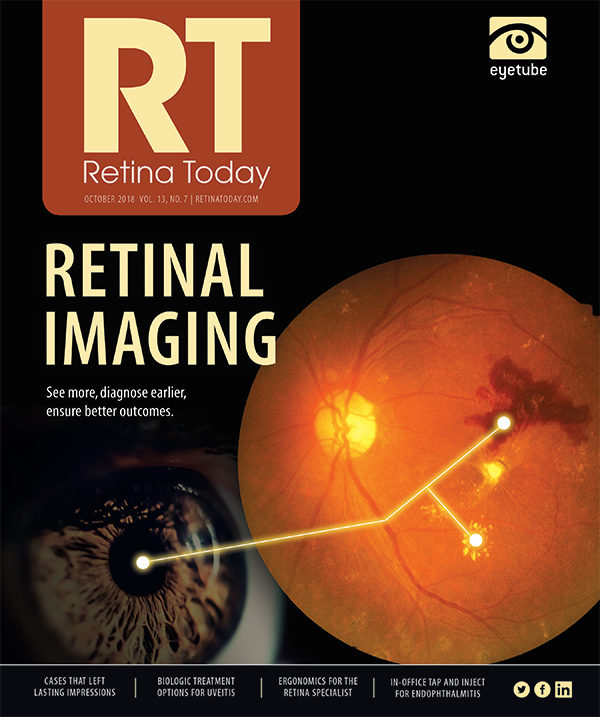 The progression of retinopathy in this patient highlights the importance of prompt diagnosis and treatment. We recommend peripheral blood analysis in patients who present with white-centered hemorrhages or retinal hemorrhages not in keeping with known ocular or systemic diseases. If you have an image or images you would like to share, email Dr. Nagpal. Note: Photos should be 400 dpi or higher and at least 10 inches wide.